Servqual is a service quality-measuring model that can be used to measure and manage the quality of service in an organisation. Service quality plays an important role in most service firms and it is antecedent to other concepts of profitability, customer satisfaction, customer loyalty and customer retention. To measure this, a questionnaire is deployed to understand and measure the expectations and experience of customers regarding a particular service offered to them. The survey will be used to identify a gap in the customer’s perception and expectation of a particular service. The survey questions are asked following the dimensions of SERVQUAL known as “RATER” (Responsiveness, Assurance, Tangibility, Empathy and Reliability). This model allows customer service experiences to be investigated and measured quantitatively. This has been used extensively by service delivery organisations and it can be adapted to suit your study area e.g. if you want to apply servqual in a grocery settings, “Products (P)” can be added to the original model (RATER) and measured to understand how customers feel about the offering, making the new dimension “RATERP” in measuring and managing service quality in this context. The customization attribute of SERVQUAL is applicable to all service areas, which makes it one of the most widely used tools in measuring the quality of a service. Responsiveness: The readiness to support customers and to provide timely service. From the questionnaire analysis, if customer expectations are higher than their perceptions of service received, service quality is viewed as low (not satisfactory) but if their perception is higher than their expectations, service quality is viewed as high (satisfactory). 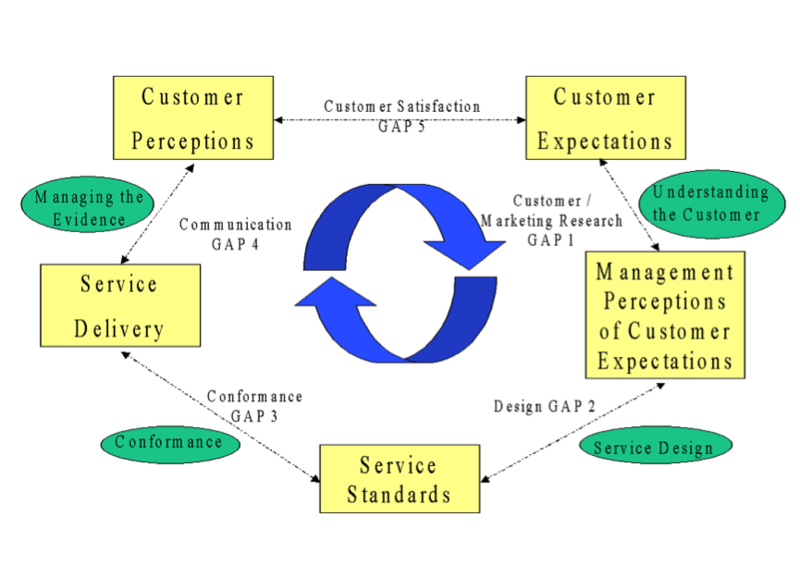 As indicated by Dr George Easaw in the Gap model shown below, a low service quality is a gap in the customer service quality process which directly has an impact on customer satisfaction levels. If a customer is not satisfied, it can affect their loyalty and retention which makes it a priority for organizations to identify such gaps using the Servqual tool and examining further to identify the root cause in order to improve the existing service quality processes. To investigate a gap in the service process, employ the use of the 5WHYs tool. The customer is unhappy because his pamphlets were delivered late and it didn’t meet his program timing. The customer pamphlet delivery arrived late. Why? There was a shortage of printing ink. Why? Spare ink had to be found. Why? The ink was replaced but eventually the printer alerted the technician wrongly. Why? It had not been crosschecked after replacement. Why? There is no machine checkup/maintenance schedule. Putting up a good checkup/maintenance schedule in place after every ink replacement will help ensure that printer will continue to work effectively and never disappoint due to ink replacement. This reduces delay and will help improve the process. Write down the problem statement. Putting the issue in text will help you describe the issue clearly and help you validate it. It also keeps a team focus and put their eyes on the big picture which it to prevent it from recurring. Question why the problem occurs and note down possible answers. This is mostly achieved through brainstorming. Check the possible answers noted in step two with the problem statement in step one and if it doesn’t identify the root cause, ask the why question again and note down your possible answer. Repeat step three until an understanding is reached and the issues root cause is identified. Have it in mind that the why questions might be asked fewer times or more than the 5whys before we achieve our aim. 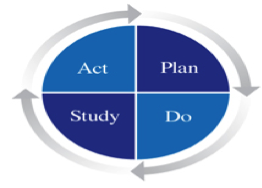 After identifying the cause of the gap in service quality, the next step is to fill it by improving the existing processes, which leads us to the third tool known as the PDSA Cycle tool. If a business want to stay competitive and successful, it needs to address the root cause of service quality issues and constantly drive improvement at the CSPs to avoid poor service delivery. As demonstrated by the diagram above, you need a plan on how to address any issue identified in service delivery, implement the plan (processes) by doing, study the new processes meant to improve the service in other to check if it is serving its purpose and act accordingly. This will help fill the gap initially identified and it will continuously ensure that customer’s perceptions of the services are higher than expectations. Conclusively, the three techniques (SERVQUAL, 5WHYS & PDSA) are individual tools but if combined together by a professional in any service environment, one can continually achieve enhanced customer delivery processes that will then lead to customer satisfaction, loyalty and retention. How have you been able to improve the customer service processes in your organization? Kindly share your suggestions in the comment section below or through your preferred social network. Thank you.